Making a travel video is an effective way to share your vacation experiences with your family and friends. Many people get video footage while traveling but they are unsure how to make a good travel video. Video production is a creative endeavour, and there are many approaches to creating a travel video. A few professional tips for Editing Your Travel Video in FCP will help you get started. Once your photos and videos have made it onto your laptop or home computer, they can easily become cluttered or overwhelming. Take some time to sort through your photos and place them into folders. These can be as detailed as food, sunsets or landscapes, or as broad as the city you were staying in. If you have video files, you may consider putting them into folders that will help you when compiling your initial video: B-roll (all of your extra footage), wide shots, animals… whatever makes sense for the video you’re planning to create. Also feel free to make a “keepers” folder for the shots you know will definitely make it into your final piece. Just don’t delete anything at this step! You never know what you’ll end up using for your final video. If you are not ready to dive into a full-blown video project, start by putting together a nice slideshow of pictures set to some of your favorite songs. Windows MovieMaker, iMovie and FCP for Apple are great starter programs that allow you to easily import photos and add transitions at set intervals. Here you can learn pacing and how to tell a story with pictures that you already have on your computer. Burn your slideshow to a DVD and show it on your TV to impress your friends. Once you’ve gathered all of the best photos and videos you took on tour, start compiling a series of your favorite footage with FCP in the order you want your video to flow. Just like any good story, your video should have a beginning, middle and end. Make your video as concise as possible and if a particular shot does not fit in with the story you’re trying to tell, leave it out. The most interesting videos all have one thing in common: they have a variety of different angles and shots. Make sure to balance panoramic views and movement with static shots for effect when you are editing your video in FCP. Duration is also crucial. You will want shorter shots as well as longer ones. All of this variety will keep your audience engaged. Gradual transitions, known as dissolves, can be very effective when it comes to a travel video. Standard cuts can become stale. When you add in dissolves in FCP, they help ease the transition between shots and make the video feel more professional. Anywhere from 5-10 second dissolves usually work the best. As you have get the tips to for Editing Your Travel Video in FCP above, you should have faith on making your travel video that people actually want to watch. Now I like to let your editing work with the nice travel video in FCP more smoothly even if you are a FCP beginner. Some people feedback that they encounter such many problems when they edit video in FCP like no audios, no video images or can’t be imported issues. 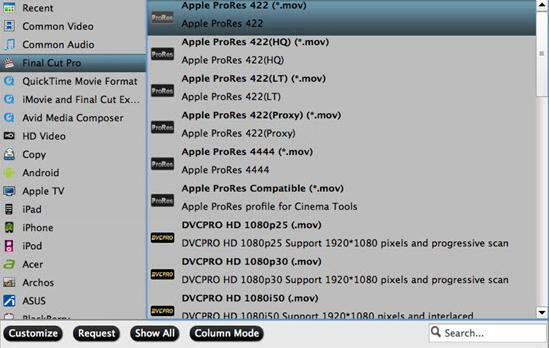 It mainly caused by the incompatible video format, for Final Cut Pro, the best compatible format or codec is Apple ProRes(Apple ProRes Codec Types). Final Cut Pro can not decode all of the video codec sometimes. Pavtube Video Converter for Mac(read the review) are high recommend here for you. It is a professional video tool can be convert all your travel video into FCP with the best compatible format or codec of Apple ProRes. With it you can merge several travel video clips into one bigger file and splitting one video file into several clips according to the clip quantity, duration time and file size. Meanwhile, it can handle multiple videos and realize batch conversion to save your time and energy. This program can be supported by latest Mac OS X El Capitan. How to Make Eidting Travel Videos More Smoothly? Step 1: Install and launch this program. 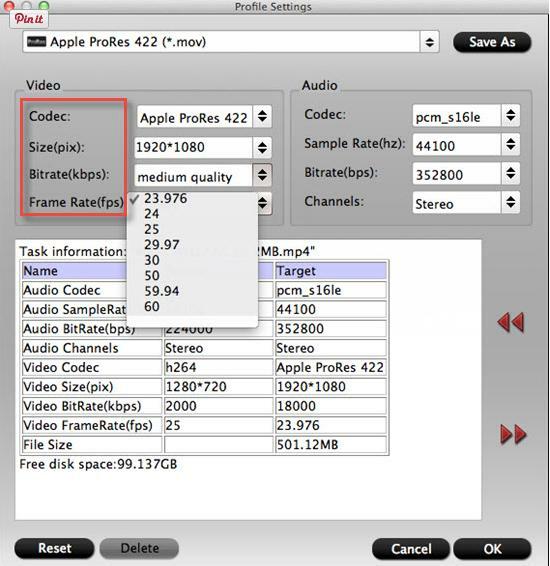 Just drag and drop video files to the main interface of the program to add videos. If you have several video files that you want to convert in batch, just drag the folder where the sources are to the software. Step 2: Click the “Format” drop-down menu to choose an output format that you prefer. Click “Format” bar, from its drop-down options, move your mouse to “Final Cut Pro > Apple ProRes 422 (*.mov)” to select it as the output file format. Step 3: Before converting, you can edit the Canon footage to achieve a better overall effect. Simply highlight a video clip and click the “Edit” button beside it to enter the Video Edit window. You can then crop, trim, rotate videos, adjust Canon recordings effects, add text/image watermarks, etc. as you like. Step 4: Hit the convert button under the preview windows, the conversion will started immediately. When the conversion is completed, run the FCP and import the converted footage into it with more smoothly editing. How to fix a general error in final cut pro 7?